Dunamaise Arts Centre in Portlaoise has been developing a superb visual arts programme over the past number of years, with strong collaboration through Laois Arts Office and Gallerist Board Member Kevin Kavanagh. It helps that the arts centre has a double height top lit dedicated gallery space, unlike many arts centres where the gallery comprises foyer and cafe wall space only. 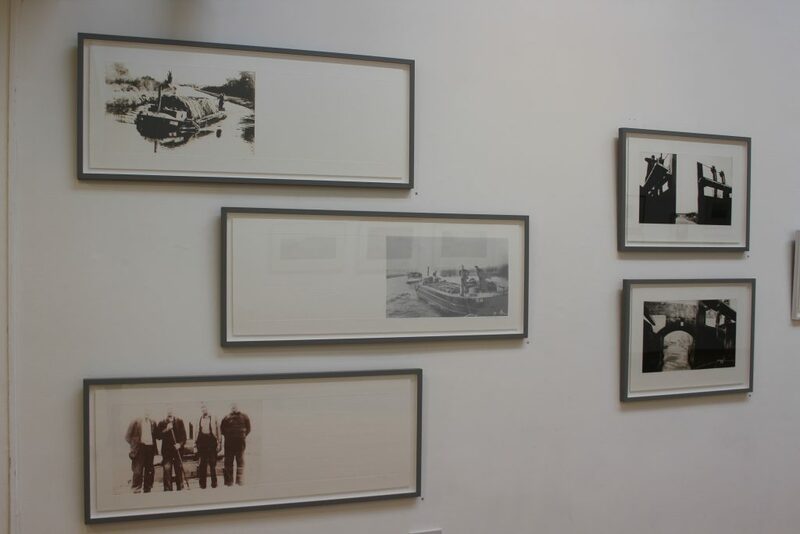 Plate, Paper, Print is a fine-art print exhibition, curated by artist Geraldine O’Reilly who has a past track record of curating major fine art print exhibitions in Ireland and internationally. This exhibition features the work of 10 artist members of Graphic Studio Dublin: Geraldine O’Reilly, John Campion, Ria Czerniak-LeBov, Julie Ann Haines, Desmond Kenny, Sarah Rodgers, Robert Russell, Dermot Ryan, Michael Timmins and Vaida Varnagiene. Graphic Studio Dublin is Ireland’s oldest and largest fine art print collective, established in 1960 inspired by Parisien Studio Atelier 17. It is studio with a global reputation for some of the finest etchers in the world – and this exhibition demonstrates this in spades. 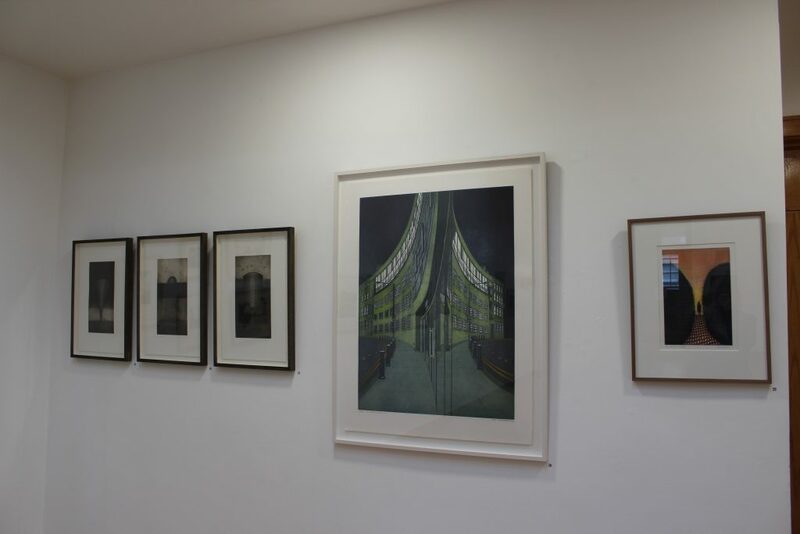 Julie Ann Haines exhibits two small bodies of work, a series of night etchings with beautiful urban colour palettes, and a triptych of monotypes (prints where the image on the plate is then printed once – making a unique painterly hand made print). Haines is comfortable in both media. Like Haines, artist Desmond Kenny works in a number of art media, and his heavy impasto oil paintings influence the colour in these stunning vibrant mixed media screen prints. As time goes on Kenny works in bolder scale and colour – as seen in the large scale work on the cafe walls in Dunamaise Arts Centre. Michael Timmins lithographs comprise landscapes worked delicately into bavarian lithographic stones, and hand printed in small editions in his studio. Timmins runs Independent Editions, one of Ireland’s only fine-art print studies where traditional stone lithographs are made. He takes a technique going back centuries, and uses it to make beautiful urban scenes like ‘Luas Line’. Sarah Rodgers etchings have a dark essence in subject matter with rodents dining in dimly lit Victorian interiors. The quality of the aquatint is superb. Aquatint is a tricky etching technique where parts of the plates are exposed in various degrees to acids to give shaded tonality. The subtlety in these works shows a deft etching hand at work here. Robert Russell is Master-Printer at Graphic Studio Dublin, and he is one of a handful of artists in Ireland who can master some of the oldest fine-art print techniques such as mezzotint. 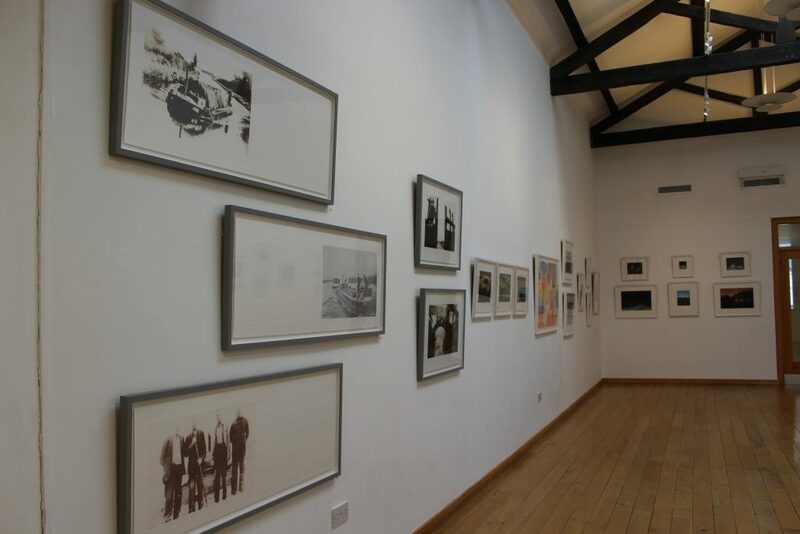 He has also assisted hundreds of Irish and international artists to turn their hands to fine-art print, under the Visiting Artists’ Programme at the studio. Here in Plate, Paper, Print he shows his highly skilled etching hand. ‘Morning Light’ was exhibited in this year’s RHA exhibition. The delicate landscape belies the extraordinary skill in this multi-plate etching. The atmospheric sky is created by using a technique called spit-bite where acid is brushed like watercolour across the copper plate, biting pits into the plate. These will later hold additional ink to become the cloudscape. 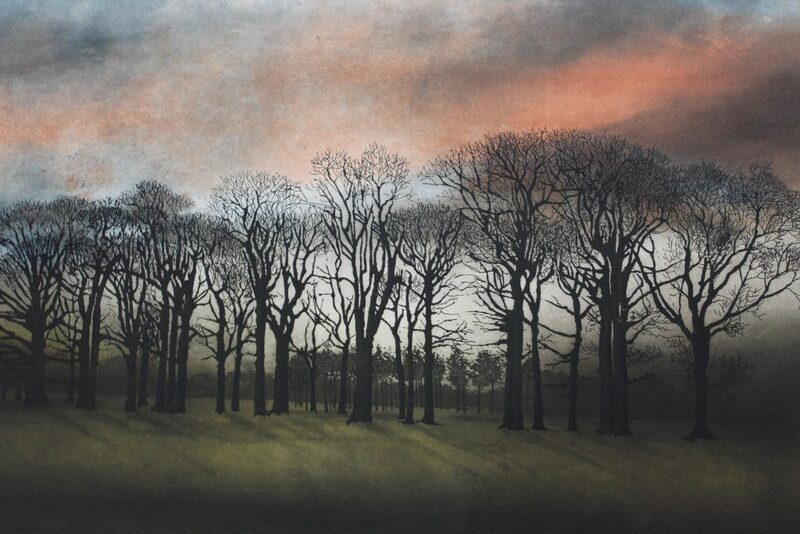 Similarly ‘Fire over Phoenix Park’ is etching perfection at its best. Ria Czerniak-LeBov uses the technique of printmaking to cleverly construct the composition of her scenes. By planning the absence of image within the plate, her works such as ‘Departure-A Re-enactment’ have a strong graphic element. Like Rodgers she has used the aquatint technique within the etching to provide deep areas of tone, to great effect. I particularly liked the subtly sketched engraved lines – a little free hand of the artist in a process that is highly structured. Vaida Varnegiene’s work shows her graphic prowess in the Tower Series in this exhibition. Her ‘South Great Georges Street’ shows us the street as never before, a block of graphic architectural shapes, against the Dublin skyline. Geraldine O’Reilly’s work almost always includes an aspect of our history, and these canal works are no exception. O’Reilly has delved into waterways archives, and interviewed many bargemen to depict the social history of our canals and the people who have used them through the generations. The wide barge etchings are printed on paper that mirrors the size of barge navigation maps. Using old photographs O’Reilly uses a relatively recent photo etching technique whereby photopolymer plates are exposed to the old photographs, effectively creating a 3-d negative plate. This photopolymer plate is then hand inked and printed, just as with traditional copper plate etching. In ‘Bargemen’ she has printed the embossed names of the men who navigated the waterways alongside the Bargemen. Similarly in ‘Barge No. 51M Heads Towards The Shannon’; the ghost like faded photo of the men and their boat, echoing the journeys they made through the soft water course embossed alongside them. 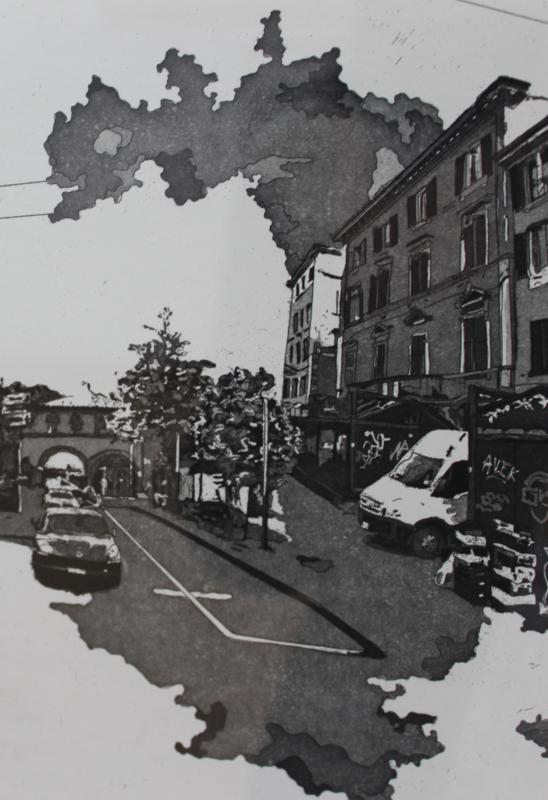 John Campion’s etchings demonstrate a variety of etching skills printed in monochrome. In Plate, Paper, Print he exhibits delicate Irish writer portraits alongside still life works. His ‘Max Bally’s’ demonstrates a wide range of aquatint and spit-bite techniques to great effect. Dermot Ryan’s urban landscapes are going from strength to strength since he returned to Graphic Studio Dublin a number of years ago from London. He has been consistently pushing the boundaries of what etching can do for his work, and it shows; from the burnished lights in ‘Parallel Lines’ to the Edward Hopper-esque ‘Frontlines’. This exhibition is a real snap-shot of the best of contemporary Irish fine-art print, and some of the artists who are pushing centuries-old techniques into their own contemporary practice. 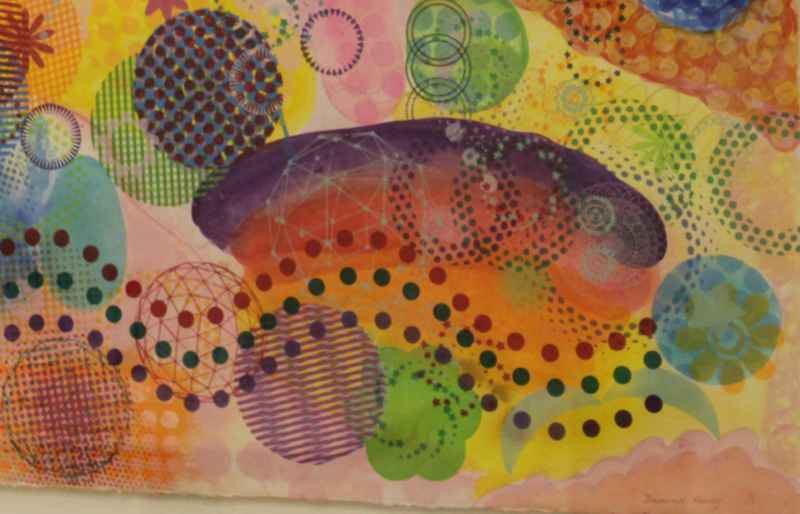 The art in Plate, Paper, Print was hand-printed in the co-operative environment of a shared artist studio space, and all are for sale. If you are planning to start an art collection for your home of business you could have some of Ireland’s finest art on your walls while supporting the artists, studio and arts centre to continue to make great art. Plate, Paper, Print is on show at Dunamaise Arts Centre until 17th February 2019. What is a Fine-Art Print?